Do you have a non-profit organization that you own or are a part of? Have you been looking for a professional WordPress theme to help your organization’s website stand out? If so, I hope that one of these themes will work great for you. 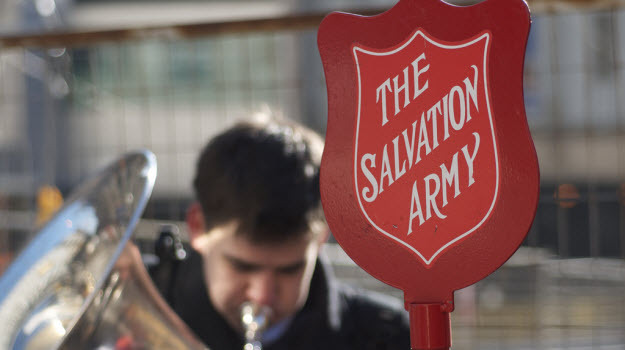 Whether your organization is religious, educational, artistic, or even a charity, these themes can really make your cause shine. Plus, you’ll be able to collect donations, which are sure to help grow your organization as well. 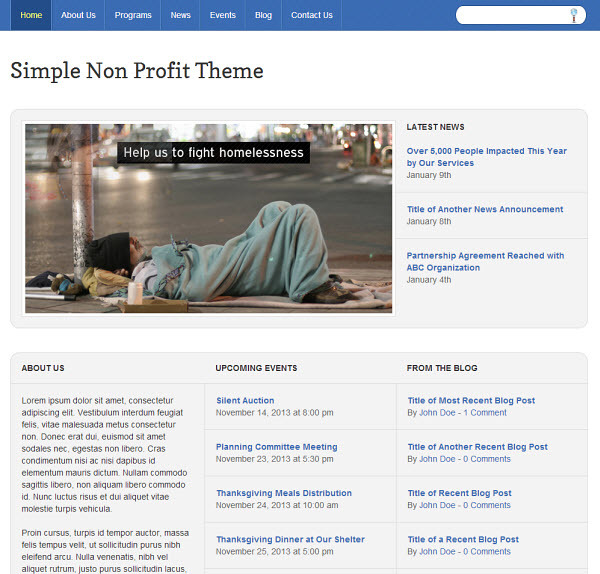 Mission is a responsive theme for charities and foundations and includes a noticeable “Donate” button at the top of the theme. Beside the donate button you’ll find colorful buttons that let visitors email you, follow you on Twitter, ‘like’ your page on Facebook, and search your website. The beautiful large slider at the top fits to the width of your screen and is great for showcasing photos from your latest events. The home page has a layout builder, to help you make your website unique. Best of all, there are numerous video tutorials to help you customize the Mission theme and make it truly unique to your non-profit organization. 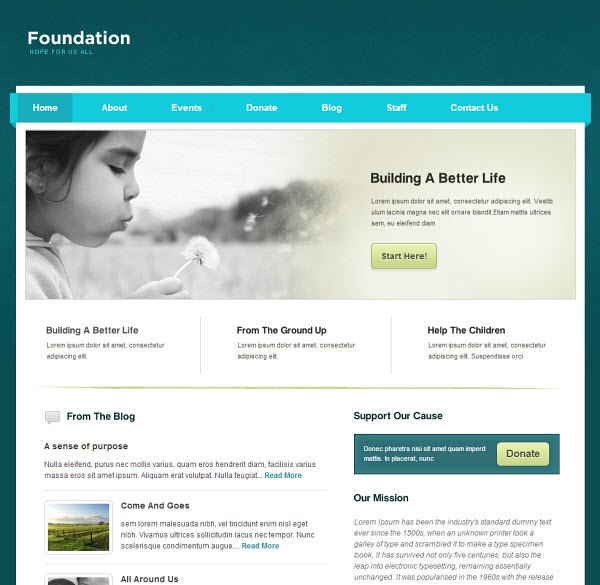 Foundation is a simple and clean, yet powerful theme that is great for any non-profit organization. Even though it’s ready to use right out the box, you’ll find that there are a few customization options that will help to make it unique to your organization. Foundation includes 3 color schemes, a feature slide show that supports both images and videos, and an options panel with extra features. You can also choose to includes a PayPal donation button, which is easily accessible right below the feature slide show. You may also like Hopefull, a non-profit theme from the same company that created the Foundation theme (mentioned above). It includes 5 color schemes, a feature slide show, theme options panel, donation widget, and a full-featured blog. The theme comes with the theme files, PSD files, and user manual. The “Donate” button is in a great location, so that visitors can easily support your cause. The home page also displays a few posts from the blog, should you choose to enable it. 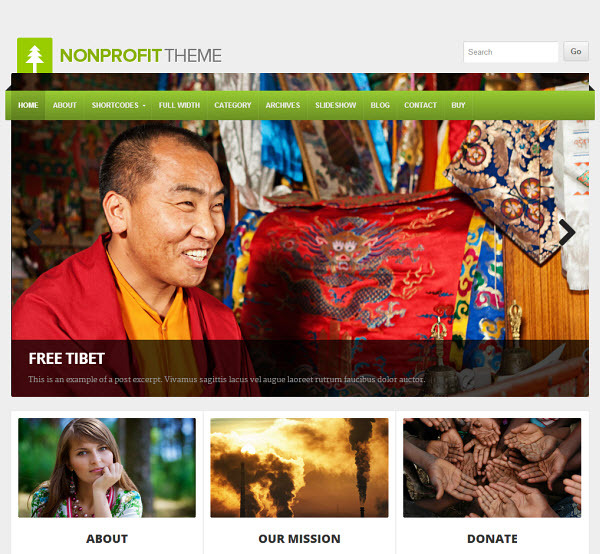 Non-Profit is a responsive theme from Organic Themes that is truly beautiful; it was created with non-profit and environmentally conscious organizations in mind. The only thing really missing from this theme is a donate button, but that is easily remedied with a PayPal donation plugin. The feature list is pretty extensive and includes: options framework; WooCommerce compatibility via the WooCommerce plugin; Google Fonts integration; custom header, background, and menu; featured slider, images, and videos; Gravity Forms compatibility; expanding footer widgets; and much more. 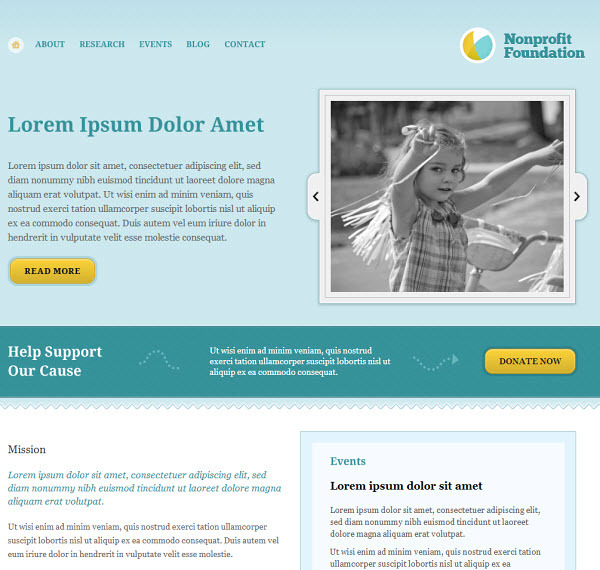 As the name of this theme implies, it’s a simple theme for non-profit organizations. There are a few aspects that can be easily customized such as the home page slider, events calendar, and logo. It includes 7 color schemes and you can even display 5 upcoming events on the home page. One of the cool features of this theme is the events calendar. Since you must insert a date and time for your events, the theme knows when events have passed and will automatically remove them from your website. Simple Non-Profit also includes a custom post type for news announcements. As you can see, this theme includes everything a non-profit organization needs to thrive. 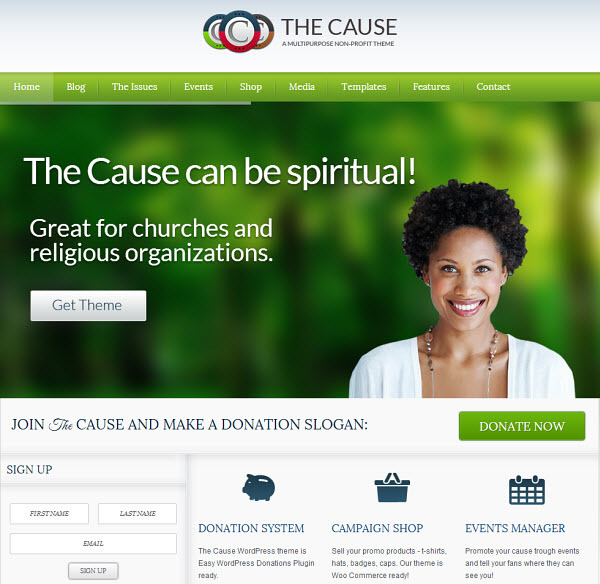 The Cause is a really advanced WordPress theme for non-profit organizations that is both clean and elegant. It doesn’t just include a donation button, it includes an entire donation system; visitors can chose a predefined amount to donate to your cause. It’s also compatible with WooCommerce, in case you want to add a shop and sell your own products. There are also: 20+ page templates, 6 custom post types, 13 custom widgets, and 8 Google Fonts includes. The Cause also features Slider Revolution, an advanced drag-and-drop slider plugin that is also responsive. The style changer that pops out on the left side of the home page is also impressive. This is a theme that I really want to use for a non-profit organization (church) that I’m a part of. I’m sure you have a favorite non-profit organization theme that you’ve come across at one time or another, feel free to share it with us. If not, what you’re favorite theme on this list? If you have a non-profit organization that you want us to check out, also feel free to leave a comment about it. I’d love to support. I am Elena Farinas, Founder, CEO of new US. Government, Internal Revenue Service 501(c)(3) approved Non Profit Organization. Our mission is to reduce poverty and Illiteracy through online training school websites. http://www.schoolonlinecollege.com and http://www.freehelpeducation.org, the site is more for courses information. I am in critical need for public support donation to FUND FOR COMPUTER LEARNING CENTER. I would appreciate Web designer to create a much simpler website by using the content on our website, reduce to the main purpose of funding support. Your compassion of helping the impoverished people is heartfelt appreciated. FCIG. DBA: Free Help Education Org. First Choice Inspection Group, Inc. dba: School Online College.Com, Free Help Education Organization .To help people improve quality of life, gain knowledge and skills by literacy and lifelong learning services, therefore reducing poverty and illiteracy, to maintain dignity and control in their lives through Computer technology learning through advocacy, training, information, and education. resulting empowering individuals quality of life. I tried to use the Foundation, but nothing seems to work, the sub-menus, the slider does not let me upload images, I tried to contact them asking for help, after 3 emails nothing….. so if you have any info let me know, thanks! I am using Foundation, it is a bit dated but still looks good. Hey Menj, did you get it to work fine? Did it work ok for you? I tried to setup but a lot of the things on the Foundation theme don’t work, and they didn’t reply to my emails for help either, can you help me?